One of the things that I have found over the past several years, and it seems I am destined to ever relearn this, is that I can always find a way to get in my own way. I am a fan of classification, organization, attempts to streamline and de-clutter, yet I always seem to have too much stuff surrounding me. Note, this is not a complaint, but an observation. I love the home I live in. It's not opulent, not hugely spacious, but it serves the needs of a family of five quite nicely. The one drawback, at least for me, is that there has to be someplace where chaos can exist so that order can take place elsewhere. Ironically, those places seem to be my garage and my office (i.e. my two "creative domains"). There is a joke among "organizistas" that allows for the "ten percent rule". No space is ever completely organized. There is always some place where there is chaos and disorganization. Every immaculate kitchen has a junk drawer. 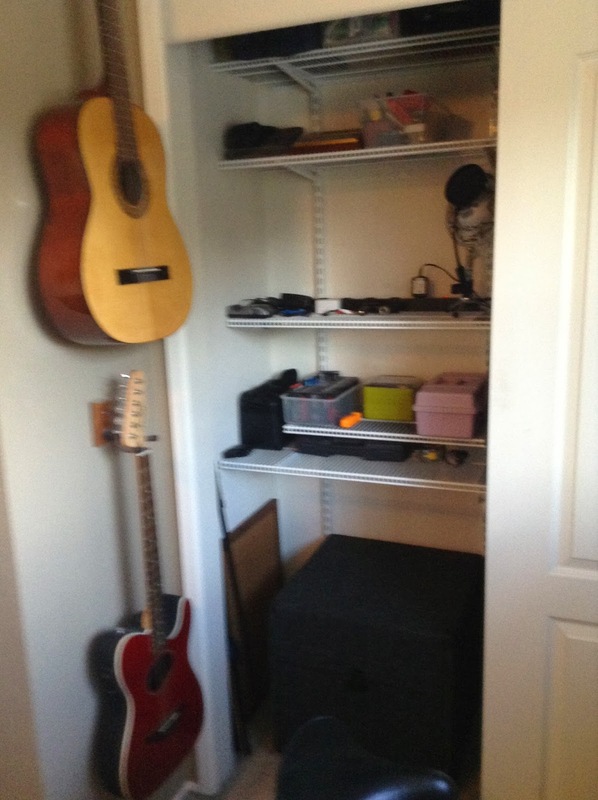 There is one closet that is not perfectly organized, and one room tends to be a jumble of things. Often, it is because the activity or purpose of those areas is perpetually labeled "miscellaneous". It's where all of the odds and ends tend to end up. My office gets this designation. Understand, my office is the most "unlovable" room in our house. For various reasons, the previous owners of our home, when they chose to build an upstairs addition over the garage, decided to route out a section of the garage to put the staircase. They made a large main room, a half bath, and a "bedroom". Well, some room had to go over the staircase, and to be creative about it, the "bedroom" was the spot chosen to be over the stairwell. Were the room to be a perfect rectangle, it would be nine feet nine inches wide by thirteen feet six inches long, with five and a half feet by two feet taken up by closet space. But this isn't that room. Instead, there is "the bump", four feet six inches by four feet four inches, that goes over the stairs. This unfortunately placed bump makes the room a bit, shall we say, less than ideally shaped. 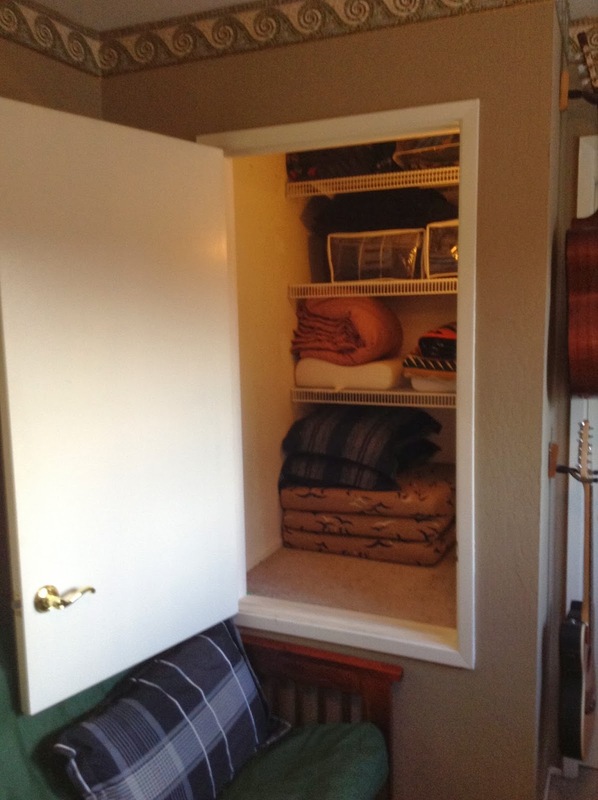 To the previous owners credit, they did make some interesting use of the space and made an additional closet out of it, albeit a closet with a floor that rises above the floor of the main room. There were a few owners that owned this house before we did, and everyone who owned the house before us used this room for the same purpose. It was "the office" or "the spare room", because it did not fit any pre-conceived plan to be used as a regular bedroom. Feng Shui was not taken into account when this room was made ;). 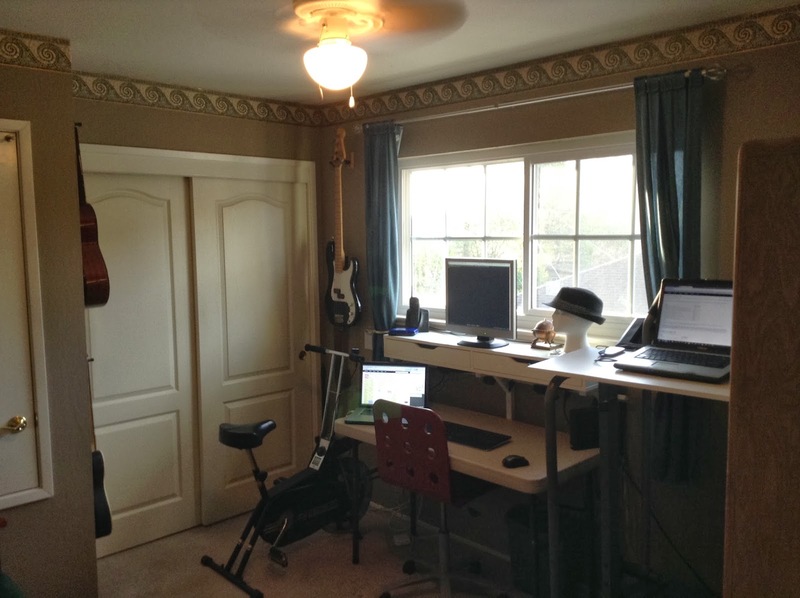 Thus, I tended to do the same, and for fifteen years, this room has undergone several transformations, purges, redesigns, clutter abatements, organizations, reorganizations, and somehow, I still manage to get work done in here. The room has to serve several purposes, mainly because there's no place else to practically have me do these things. 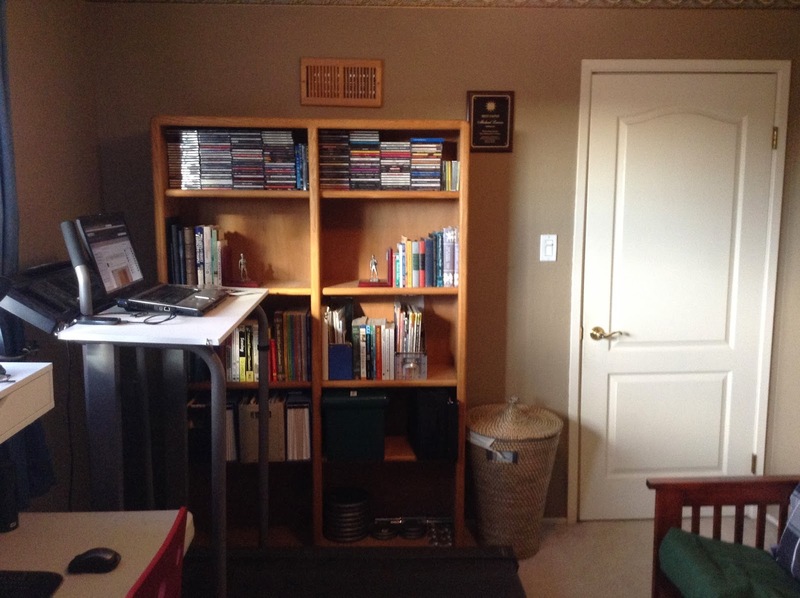 Not only is my office my work and testing space, my writing haven, my exercise room, my craft room, and my recording studio, in a pinch, or a late night or early morning call or work assignment space needed, it doubles as a meeting room, a lounge, a reading area, and occasionally, a guest bedroom (and likewise, on occasion, "my" bedroom, when I find it late and I just need to get a couple hours rest before I get up and go to it again). The biggest challenge with a multi-purpose room is the need to switch tasks, and have a system where I can do so effectively. 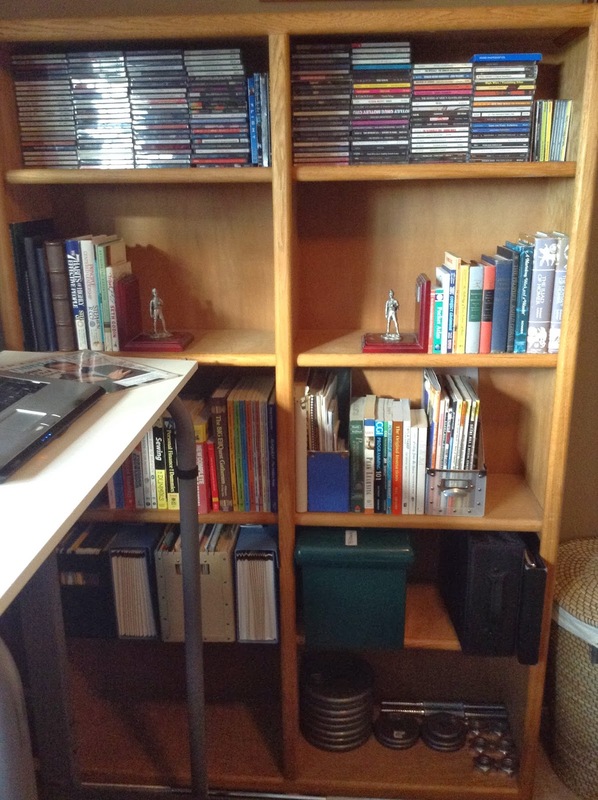 "A place for everything and everything in its place" is great in theory, but very often, I find myself having to contend with two or three projects needing the same space. thus, what often happens is there is a bundling up of stuff, stuffing wherever I can make room, and then getting back to it when I can. 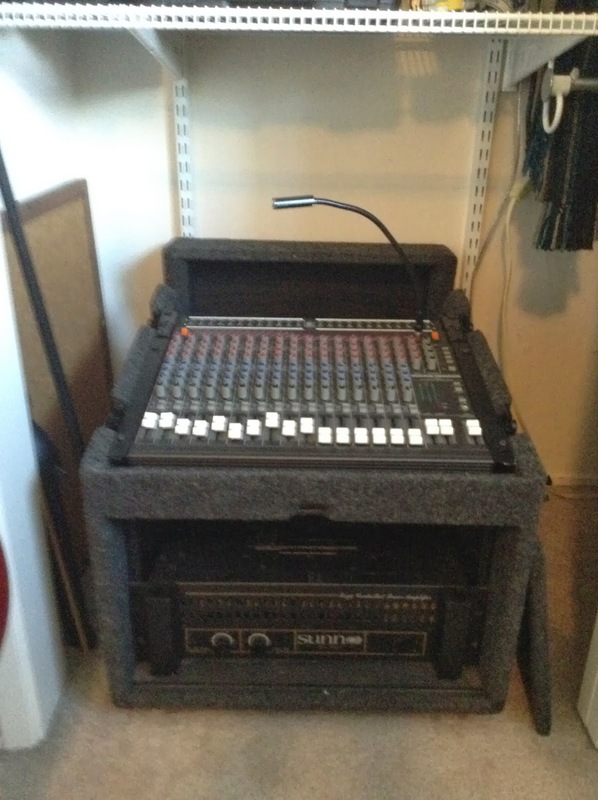 It's a room that invites fiddling, tweaking and moving stuff around to find that "best spot" to put everything. In short, it's a place where, very often, I find that I get in my own way; my best laid plans for one project/process cause me to be horribly inefficient for another. In an ideal world, I would just say "OK, well, I will set up another room to do that other thing", but that's not really an option. To keep a happy home, this room is my domain for whatever project I need to be working on, and as such, it has to work, odd and ends and all. I liken this to my testing career. Too often, people on the outside look at testing as though it's a neat little atomic and simple process. You look at something, you expect a behavior, you confirm the behavior, it passes. If it doesn't confirm the behavior, it fails. It limit testing to a very simple yes or no system that is efficient, elegant, and easy to organize. Hate to be the bearer of bad news, but testing is none of those things. It's wildly cross-discipline, it takes from many places, it needs many unique resources, some of which are really hard to categorize. Testers don't just have a small set of tools at their disposal. In fact, they literally have the entire world of knowledge to work with to help define their tests, their strategy and their approach. When you picture a heavily cluttered and wildly akimbo lab of a mad scientist, that is the essence of a tester, and the way a tester often works. Does this mean that we cannot be organized, that we cannot be efficient? Of course not, but it does mean that we run the risk of getting in our own way. We are often enticed by some new tool, app or device that will make things simpler, more elegant, less crowded, more organized and methodical. Unfortunately, I tend to look at testers (not all, mind you) as those people that fall under the "ten percent chaos rule". We have needs for more than the "nicely organized" environment that fits one purpose very well. We shift, we switch, we weave and bob through ideas and applications, and sometimes, that requires a tolerance for "stuff and clutter" that goes beyond what many think is comfortable. As of now, I have some semblance of control over my domain, but alas, this is a good day. Some days are more chaotic than others. In my world, the best thing I have discovered is that "nothing stays the same, and nothing ever changes unless there's some pain involved". That doesn't mean that I don't keep trying to organize and get everything where I want it to be. It means that I do my best to rid myself of distractions until I actually need them, and then know where those distractions have gone. Once I know where they are, I try my mightiest to forget they are there, at least for the time being. Ultimately, I have to be aware of the fact that, most of the time, the person that gets in the way of my progressing on something, ultimately, is me. Thus, it is best to do whatever it takes to get me out of my own way whenever possible :).